There's a lot of things that come to mind when you hear the news that Wayne Rooney is to earn £500,000 for one night's work. That's his fee for battling it our with Cristiano Ronaldo, Cesc Fabregas, Steven Gerrard, David Villa and Didier Drogba in a live spectacular at the O2 Arena to discover the world's most skillful footballer. Clearly the World Cup final, to be held just six days before, is no longer showbiz enough. The organisers are describing it as a "Gladiators-style contest" although I'm not sure if that means its going to be hosted by John Fashanu or if some of the competitors are going to die. And I'd only watch one of those two scenarios. Anyway this got me thinking. Mainly it got me thinking that this is a mad and really quite horrible world that we live in. But also it got me thinking that we should have a seperate quest, a contest to find Scotland's least skillful footballer. Obviously this can't include players that only played for five minutes because they'd somehow persuaded the manager that they were Pele's son. Players who didn't depend on the more refined footballing skills but did an effective job should also be disqualified. A rugged centre half's lack of finesse might be amusing but is hardly detrimental to his game. No, I'm talking the crappest of the crap. The players who seemed to hang around for years and years without ever convincing. The names that when you see them on the teamsheet you think "oh, for fu..."
I'll start with a Hibs contender. Joe Tortolano ran through my mind but I'll defend him by arguing that he wasn't a bad footballer. He was actually a so-so winger who was basically destroyed by Alex Miller's insistence on playing him out of position. So Joseph escapes. That leaves the way clear for Ally "Benny" Brazil. There's been worse at Hibs in the more recent past but none with the staying power, the sheer dedication to achieving such consistent mediocrity. Benny enjoyed a 10 year career at Easter Road and people still scratch their heads and wonder how that was possible. 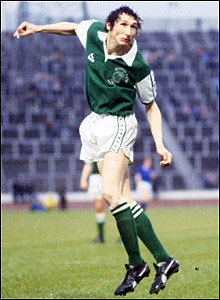 He also played with George Best at Hibs and some claim Best's "he can control it further than I can kick it" line made its debut as he watched Benny in training. George Best is now remembered as an all time great. Benny is now a bus driver in Edinburgh. Truly, it's a funny old game. So who's your most memorable crap player? The least skillful carthorse to grace your club? And who takes the title for Scotland?